We’re all very excited here that we got invited to Sunnyvale CA to get our hands on an Apple Watch on April 7th before it launches to the rest of the world. We’ll be testing Whimmy to make sure it’s nice and smooth for you to respond to invites in a jiffy (gif-y?). 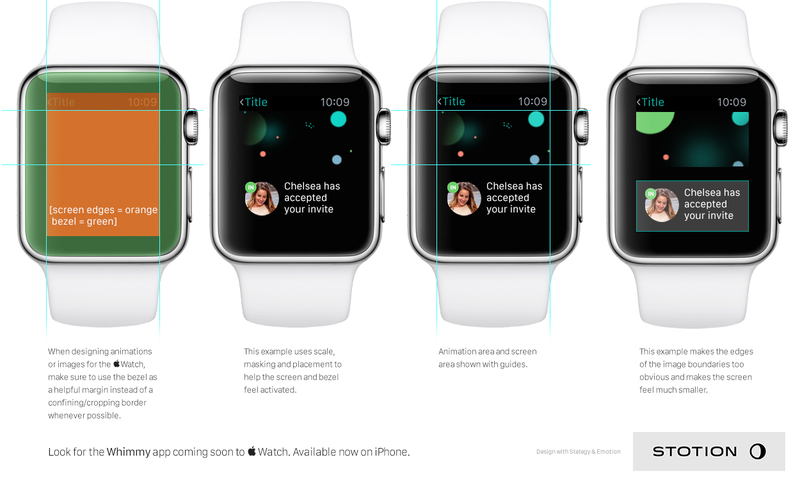 We’ve discovered a few important techniques to help the UX and UI of Apple Watch interfaces. Here’s a few helps to making your Apple Watch app feel even better. Image 1 — When designing animations or images for the Apple Watch, make sure to use the bezel as a helpful margin instead of a confining/cropping border whenever possible. Image 2 — The above example uses scale, masking and placement to help the screen and bezel feel activated. Image 3 — Animation area and screen area shown with guides. Image 4 — This example makes the edges of the image boundaries too obvious and makes the screen feel much smaller. Whimmy coming soon to Apple Watch. Available now on iPhone. Feel free to share the tip.